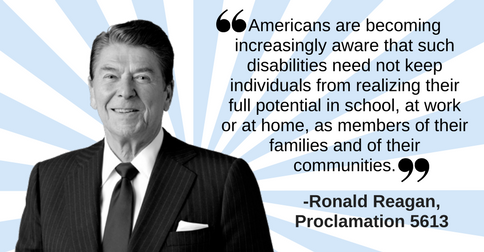 “Now, Therefore, I, Ronald Reagan, President of the United States of America, do hereby proclaim the month of March 1987 as National Developmental Disabilities Awareness Month. Thirty-one years later, we should still appreciate what an incredible moment in history that was. Today, with great effort, advocacy and education, the attitude surrounding developmental disabilities has shifted toward inclusion and self-determination. But we still have work to do. If you’d like a look-back at our posts from Developmental Disabilities Awareness Month, check out #DDAwareness18 on Facebook and Twitter. We shared our activities, history, and many resources for individuals and families.